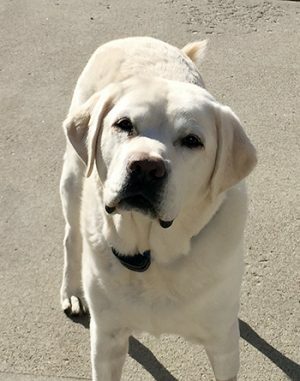 Pet Hero Cooper is an energetic 9½-year-old Labrador Retriever that is beating nasal cancer after receiving stereotactic radiosurgery (SRS). Owners Cheryl and Scot Harper of Indianapolis, Indiana, are thrilled to have their perky dog back to his normal self, but it was only a few months ago when they were shocked by Cooper’s cancer diagnosis. In 2015, Cooper started to have a consistently runny nose. At first, the Harpers figured this was caused by allergies. But, despite allergy medication, Cooper’s runny nose did not get better. Since dogs are quick to lick their noses, the Harpers were not aware of how frequently his nose was running. About eight to nine months later, in late summer 2016, Cooper was taken to his primary care veterinarian after getting a bloody nose. His veterinarian recommended they go to a veterinary specialist for diagnostic tests. An x-ray and CT scan revealed Cooper had a right-sided nasal tumor. Cooper’s tumor was large, extending from the tip of his nose up into his sinus. A biopsy confirmed the tumor was nasal adenocarcinoma, or nose cancer. The Harpers knew they had to act fast. They wanted Cooper to not only receive treatment right away, but to receive the right treatment. Three treatment options were presented. The first was conventional radiation therapy at the local specialty hospital. The plan consisted of 20 sessions over a five-day period. The second option was to go to a nearby university’s veterinary teaching hospital for conventional radiation therapy. Cooper would receive lower doses of radiation over a 20-day period. The third option was to go to PetCure Oncology at Care Center in Cincinnati, Ohio, to receive a new kind of advanced radiation therapy called stereotactic radiosurgery (SRS). SRS requires only 1-3 treatment sessions, which means fewer anesthetic events. This is possible because SRS delivers high doses of radiation with sub-millimeter precision. This precision enables SRS to treat many tumors previously considered untreatable, and with little to no side effects. The Harpers moved quickly. Only two weeks passed between their original visit with the specialist in late October 2016, completion of the necessary diagnostic tests, and completing treatment in only three sessions at PetCure Oncology at Care Center. If your pet has been diagnosed with cancer and you would like to know if SRS would be right for your pet, please do not hesitate to contact a PetCure location near you.